One of the most revered brands of our times has been the Royal Enfield Bullet. Riding one wasn’t just a matter of pleasure, for most it was a symbol of attaining manhood. Such is the aura of the brand, one of its riders who crashed his bullet into a tree on the Jodhpur highway even got immortalised as ‘Bullet Baba’. A temple that came up at the crash site draws the faithful in droves. Yet, many wouldn’t know that Royal Enfield was originally a British company, which shut shop in 1971. The Bullet continued to be produced in India by Enfield of India, until in 1994 the Eicher Group acquired both the company as well as the brand. Since then, the brand has taken many strides. India has made its mark on the global automobile map prompting the Harley Davidsons and BMWs to make a foray here. But the British brand which we acquired, nurtured and now adore is capturing markets around the globe. It is just another example of India Inc’s global dreams coming true. Here’s Siddhartha Lal, CEO of Eicher Group talking about the Indian dream. Everyone has a turning point in their lives. Mine was Royal Enfield. I loved bikes from when I was very young and was always on my tricycle and then bicycle, but didn’t think much about motorcycles. That was until I discovered the gleaming red and chrome beauty that my father had recently acquired which was in my driveway just waiting to be ridden. I was nearly 18 years old at the time, just back from boarding school and joining Delhi University, and I used to spend hours looking at dad’s Bullet. I did sneak it out once in a while to go around the colony streets and when I turned 18, I got a safety talk from dad, promised to always wear a helmet when I ride and that’s when I started my love affair with Royal Enfield. The Bullet became my soul-mate and companion and added a new and confident dimension to my personality. Freedom, beauty, power and the beat that has mesmerised generations, found another victim in me. Over the years, the Bullet (which has become synonymous with Royal Enfield in India) has stayed relevant to successive generations, despite its age. This is a great tribute to the people who designed the original bike. It’s also a tribute to the die-hard Bullet fans in India. 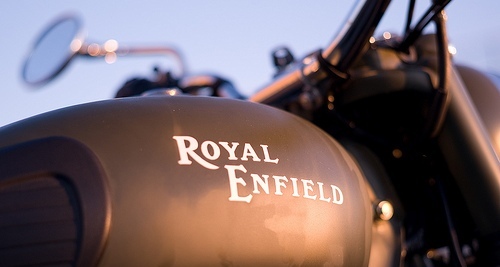 Royal Enfield as a company has seen a lot. As the UK operations finally ran out of steam in the late 60’s, Enfield India was by then self-sufficient in making the Bullet 350 and had a reasonable market at home for the bikes. In the early part of the 1980s, the Japanese entered India and within a decade (predictably, as in the West) all local manufacturers were in serious trouble. While most other indigenous bike manufacturers went under or went along with one of the Japanese giants, Royal Enfield was teetering at the edge by the late 1980s. The challenge in front of us was to find a way to re-invent the company and its business model while maintaining its character and larger than life charm, and making it relevant to motorcycle, travel and adventure enthusiasts all over the world. The trick, we believe, is to make bikes that involve the millions of people who have a passion, or at least a sweet spot for this brand. But most importantly, we are Indian — as this is our home-market and pride. We love the quirkiness of being an originally British brand, now Indian, selling bikes and a culture that has influences from everywhere but a unique personality of its own — the brighter side of globalisation. All this has culminated in the design, development and launch of a new platform from Royal Enfield based on our new and highly acclaimed unit-construction engine. The first bike from the platform, the Classic, has got excellent reviews from around the world and is the starting point of our drive into international markets. With reliability, performance and an excellent blend of the classic and modern – we can go beyond our original set of customers in Europe, US and developed markets looking for a ‘new’ vintage bike; in addition, we now appeal to a wide cross-section of people looking for something with a unique personality, suitable for leisure and practical riding with a strong emotional appeal. This will take us to markets such as south-east Asia, Latin America, Middle East, Africa and allow us to spread truly globally. With bikes such as a Café Racer and Tourer models emerging from this platform, we will have a wide range of retro-chic bikes for the world. And we will put the world under the spell of a new order of motorcycling from a brand that continues to transcend time.